If you've been following my forecasts for Wednesday's winter storm, you already know the bottom line of this forecast: It's really not about the snow totals, it's about the icing potential. It will not take much sleet and freezing rain to make for a very slippery situation. Note: It is my personal policy to not update snow/ice accumulation forecast maps once precipitation has begun. I encourage you to check out my previous weather blog post for a more specific visual of what to expect. Keep in mind, this morning's models suggest snow totals will end up on the low end of previous forecasts. As of this writing, wintry mix has begun to arrive in SW NJ. The messy weather will spread through the entire state by mid-morning (9 or 10 a.m.) That's when things will get particularly dicey, between mid-morning and early afternoon. (Check the "Advisories" section below for more specific timing, by county.) 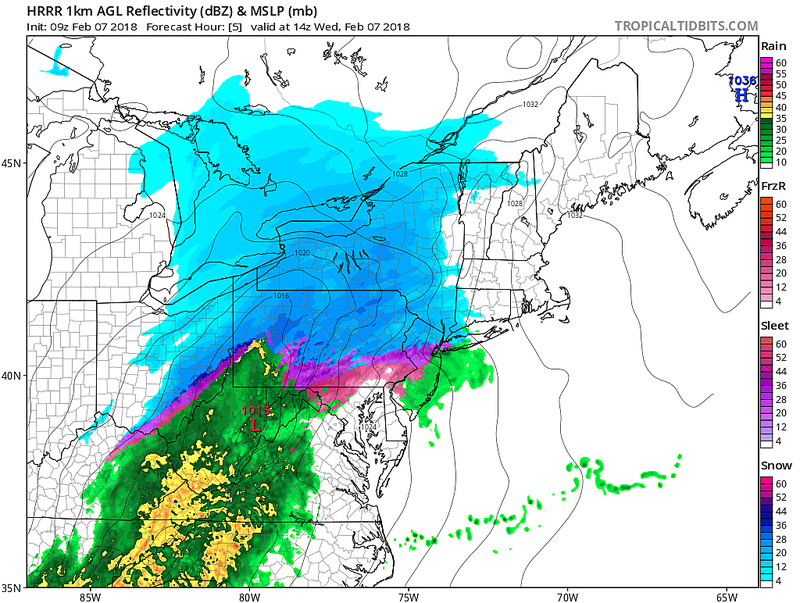 While southern and coastal New Jersey will experience almost all rain today, the rest of the state will encounter travel headaches due to the mix of snow, sleet, and freezing rain. By mid-afternoon (2 or 3 p.m.), we will transition to all rain (possibly with some residual spots of freezing rain). That rain will be heavy at times through the Wednesday evening commute. Rain should taper off completely between about 9 p.m. and Midnight. The GFS continues to stubbornly suggest a quick hit of snow as the storm system exits and temperatures continue to drop. Even if this does transpire, I do not anticipate any additional accumulation. Warnings and advisories from the National Weather Service. Pink=Winter Storm Warning, Purple=Winter Weather Advisory. Here is the latest list of warnings and advisories from the National Weather Service. The warning for western Passaic county has been downgraded to an advisory. Additionally, many of the advisories were extended by an hour or two, to better reflect the anticipated timing of wintry weather. --Winter Storm Warning for Sussex County, until 9 p.m. Wednesday. --Winter Weather Advisory for northwestern Burlington, Camden, Gloucester, inland Monmouth, and Salem counties, until 10 a.m. Wednesday. --Winter Weather Advisory for Mercer and Middlesex counties, until Noon Wednesday. --Winter Weather Advisory for Hunterdon and Somerset counties, until 2 p.m. Wednesday. --Winter Weather Advisory for eastern Bergen, eastern Essex, Hudson, and eastern Union counties, until 3 p.m. Wednesday. --Winter Weather Advisory for western Bergen, western Essex, eastern Passaic, and western Union counties, until 5 p.m. Wednesday. 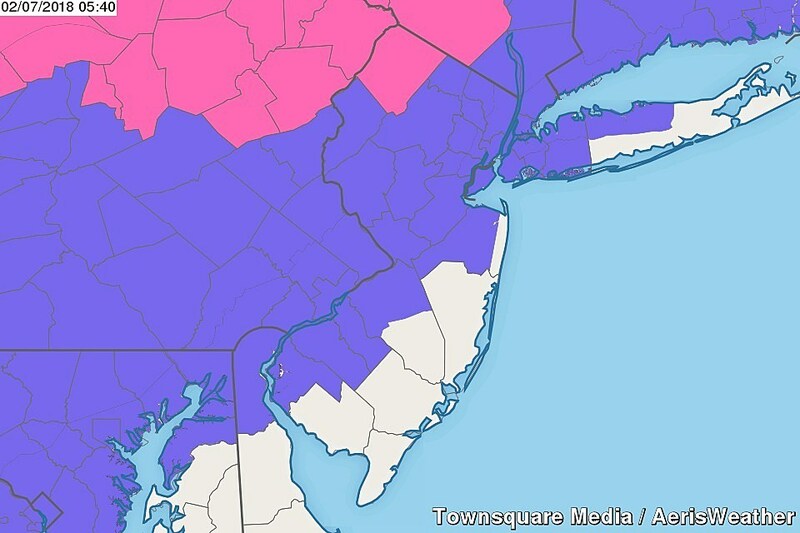 --Winter Weather Advisory for Morris and Warren counties, until 9 p.m. Wednesday. --Winter Weather Advisory for western Passaic County, until 10 p.m. Wednesday. Skies will begin to clear after Midnight, with a brisk northwesterly wind up to about 20 mph. Overnight lows will fall into the lower 20s to the north and near 30 degrees along the south coast. Sunny skies should resume by mid-morning Thursday. But it's going to be cold — high temperatures will be limited to the lower to mid 30s, about 5 to 10 degrees below normal for early February. There may be an occasional breeze, sending the wind chill plunging into the 20s. Friday looks more seasonable, as high temps return to about 40 degrees. We'll see mostly cloudy skies overhead. And, as a storm system clips New Jersey, a few snow showers will be possible for Friday afternoon and evening. Best chance for snowflakes will be in the northern third of the Garden State. Little to no accumulation is expected at this time. The warming trend continues into the weekend. Saturday will reach the upper 40s to lower 50s, even as clouds continue to win the sky. Sunday will be the warmest day of the week, with South Jersey potentially making a run for 60 degrees. But Sunday will also be our next wet day, as our next storm system rolls through. Again, given the current temperature and timing forecast, this would be another "just rain" weather maker.